On June 20th, Huqoq revealed its greatest masterpiece. I had been placed in the synagogue square on June 18th and was assigned the task of hacking at modern plaster fill covering the West end of the square. Along with several other archaeology interns, I pried at the earth with a large pick and hoe, ignorant — like everyone else — of the elaborate mosaic surface that lay underneath. Certainly, sifters had found handfuls of mosaic pieces in the region’s soil; however, everyone faced the possibility that the original mosaic had been robbed out or destroyed. Just one day before the discovery, diggers worked dejectedly through 7 centimeters of soil fraught with mysterious plaster shavings. The dig administrators presumed this fill was still modern in relation to the ancient wall beside it, and that diggers had a long way to pick before finding anything interesting. Jodi Magness even suggested that the synagogue wall might have been re-used as a cistern by the modern Arab village and that the contents of the cistern resided in this particular area. The following day, after spending the first hour of the morning sifting for small artifacts, I re-entered the synagogue square and commenced digging at the chalky substance beneath my trowel. About ten minutes later, just as I left to dispose of dirt at the dump-site (perfect timing), my co-worker discovered a mosaic image beneath a pile of plaster shavings. From the account I heard, he was greeted with the portrait of a placid woman depicted in the Hellenistic style, with round features filled with colored mosaic pieces expertly illuminating the dimensions of her face: indeed, an artistic masterpiece. Presumably, the mosaic was implanted in the Late Byzantine period (between 4th and 6th Centuries CE). As a result of the discovery, everyone, including me, was asked to exit the square to make room for meticulous excavation in which amateur archaeologists were not expected to take part. From this point forward, I was placed elsewhere for assistance. Throughout the remainder of the excavation, I watched from a distance as more of the mosaic was uncovered. The team brought in a professional conservator, Orna, to facilitate and supervise the unveiling process. Nearly the entire Western side of the square contained significant stretches of mosaic tile, and — towards the Southern end — a scene from the Hebrew book of Samson. The experience of working in such close proximity to this monumental discovery is one that will always give me a great deal of pride, and I’m confident that Huqoq will reveal even more great discoveries in the future. In the mean-time, recovery is in order. On the right: the mosaic face uncovered by my co-worker. 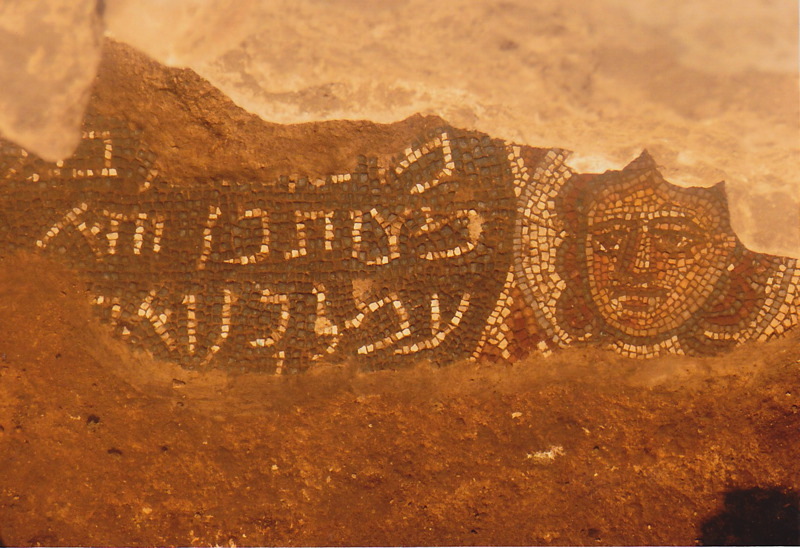 The left portion of the image displays a dedication to the depicted woman, who likely provided financial support for the construction of the synagogue. Beside the trench containing the Eastern wall of the synagogue, the Huqoq team dug a new trench. This pit would soon expose the continuation of the synagogue wall and its proximate treasures. First, of course, the dig team faced layers of modern soil dense with remains from extensive Arab occupation. 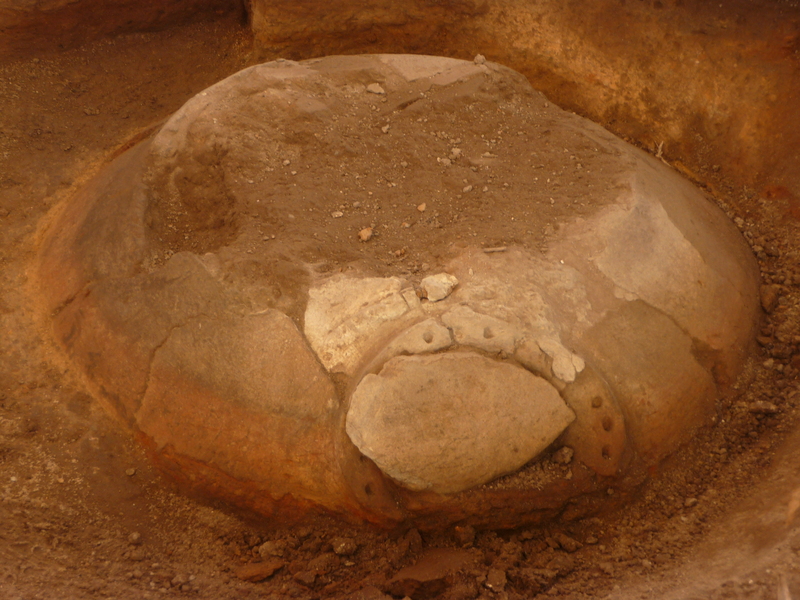 Among these modern finds, the team uncovered an old bread oven, or “Tabun,” presumably dating to the Medieval Times. Miraculously, the oven remained perfectly intact beneath centuries worth of sediment. When brushed, it nearly looked ready for use. I tried to hide my distress when the team received orders to disassemble the tabun, despite the assurance that more ancient wonders would be found underneath. Perhaps competitive administrators in archaeology must learn to privilege one layer of history over another, and of separating the importance of an ancient, communal building from the simple beauty of a humble, Medieval oven. In this regard, however, I am proud to remain an amateur archaeologist; I bear no responsibility to formulate decisions on gradations of historical value. Rather, I maintain my freedom to regard all discoveries with reverence and — ultimately — attachment. Under the supervision of pragmatic directors, the tabun was disassembled with efficiency. And then, like other layers of superfluous history, it was tossed into the dump.